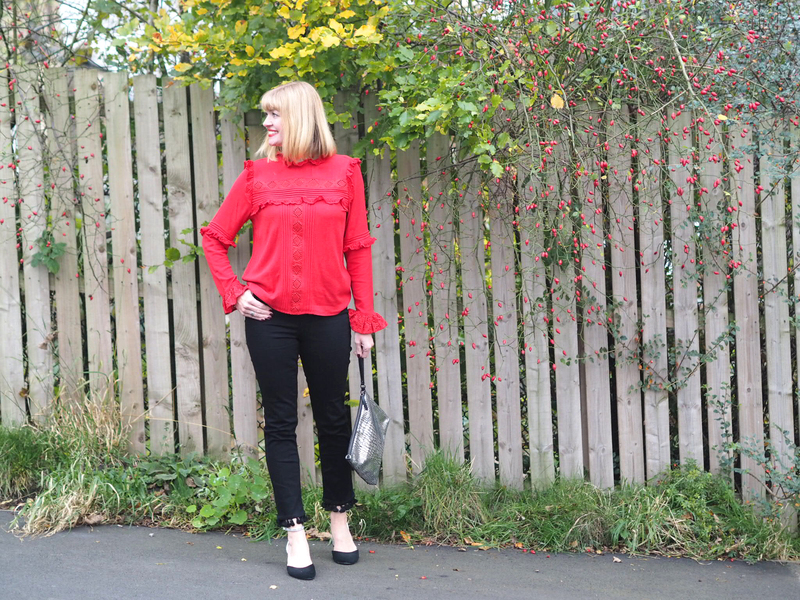 Pom Pom Jeans, A Red Ruffle Blouse And A Touch Of Glitter. Pom poms are one of my favourite adornments. They’re light-hearted. Fun. Frivolous. And I’ve been looking for some black jeans for a while, so imagine my delight when I spotted these rather fabulous black pom pom jeans. They’re from Marks and Spencer (click here) which is from where I’ve bought more this season than anywhere else. One reason is because when Harry has weekly football training in Harrogate, I can nip into the town centre for an hour. I spend most of that time in M&S, until it closes. At that time, it’s quiet so I can peruse to my heart’s content and my bank balance’s dismay. I find it easier to navigate a store than it is their website. There are currently several “hero” pieces on my radar and in my closet. You have already seen the gorgeous constellation midi dress that I wore for my birthday and I have a red velvet pleated midi skirt, that I’m saving for just a few more weeks. The skirt epitomises Christmas and comes in navy, gold and red too, all equally desirable. Things in M&S have a habit of selling out fast, so I didn’t want to miss out on it. Something I’ve regretted in the past. Back to the jeans though. They’re a slim fit and I got them in a size 12 long. (I’m 5 ft 9 and a UK dress size 10-12). The online reviews said the jeans come up slightly small. I agree, so the 12 is a good fit. They’re also available in indigo and in petite and regular lengths. 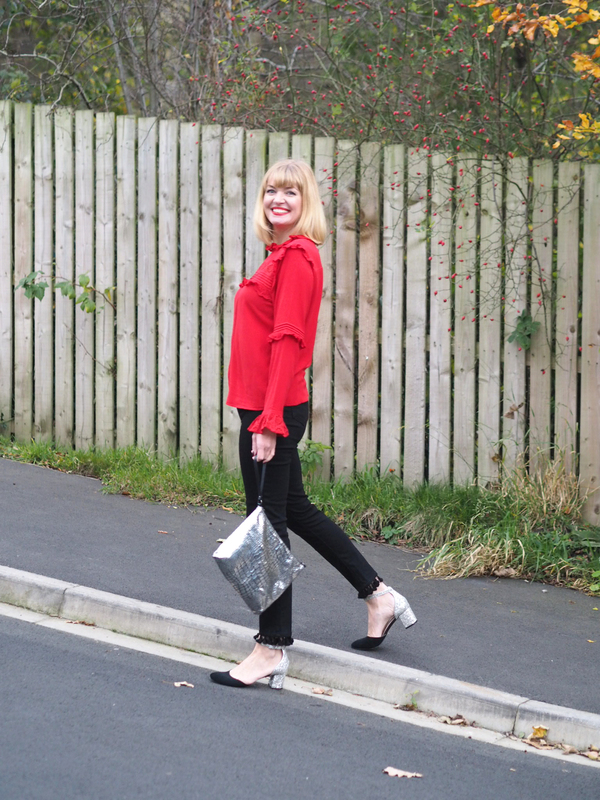 (My shoes are from Topshop about three years ago, but there are some black ones and some red ones here in M&S which are very similar and only £29.50 and some in Boden which have a higher price point but which are absolutely beautiful). 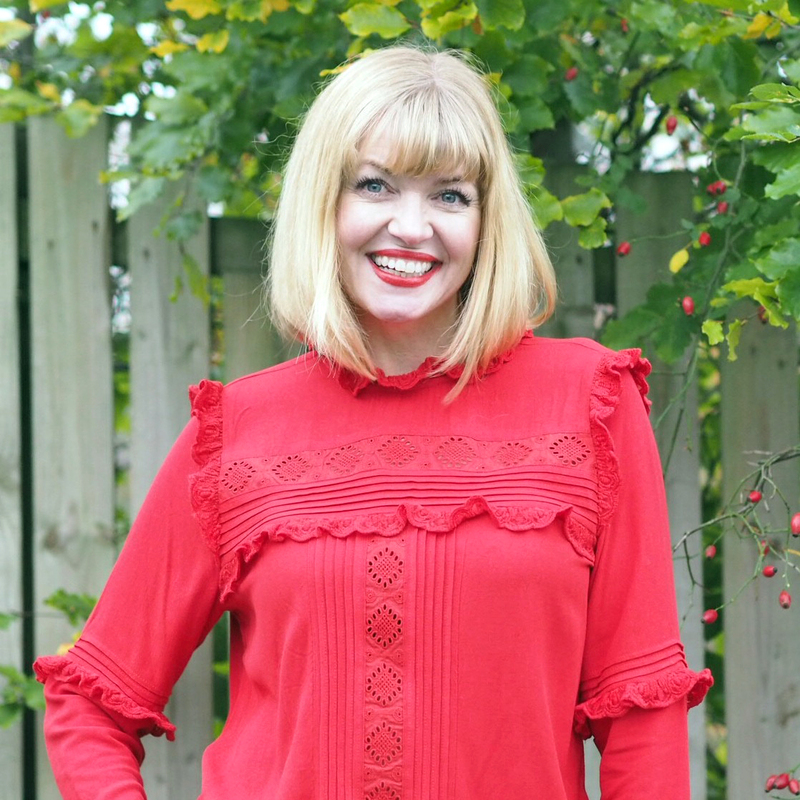 The ruffle round neck long-sleeved blouse is also from M&S. 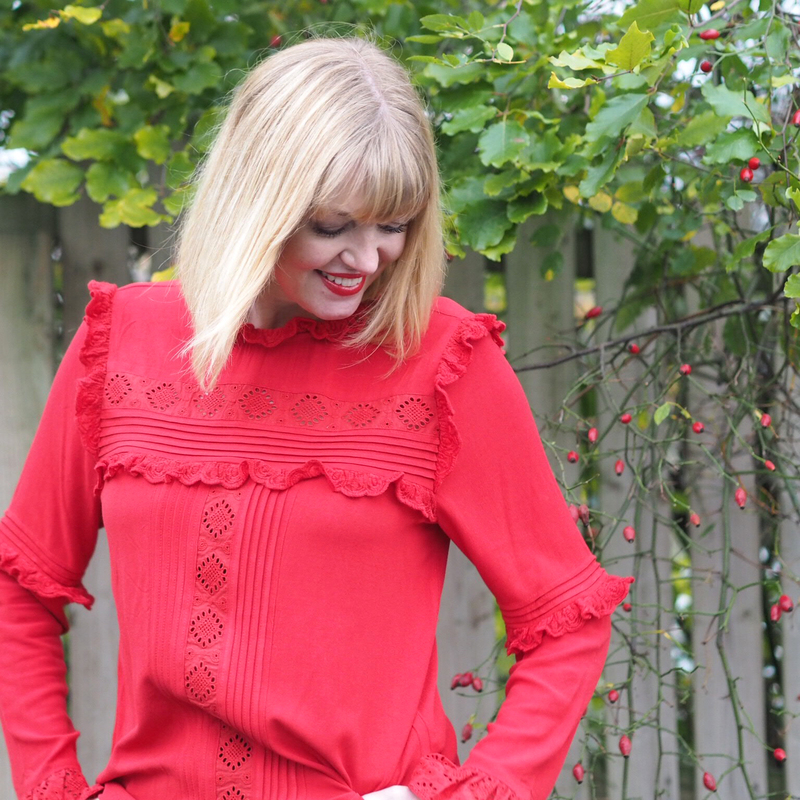 I love the vibrant shade and the feminine ruffle and lace details. It’s available in cream too. 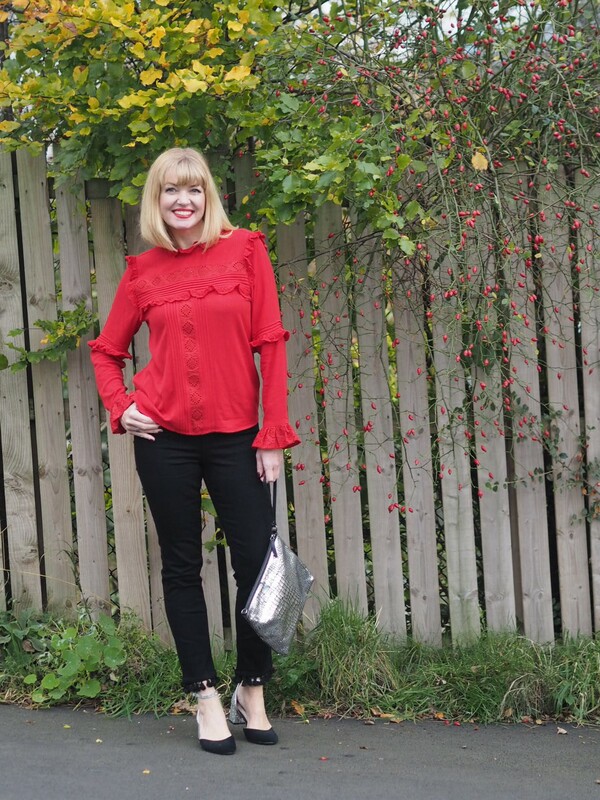 It’s this year’s version of the cream blouse I wore last year with wide-legged trousers. 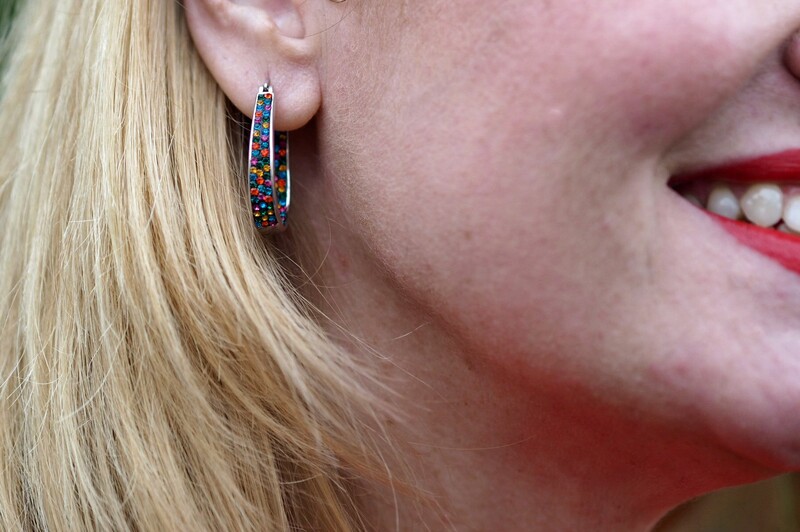 My earrings are from Eternal Collection. I can’t find them anymore on the website so I think they must have sold out. They were from last year. I have a gorgeous new collaboration with them coming soon, so keep an eye open for that. 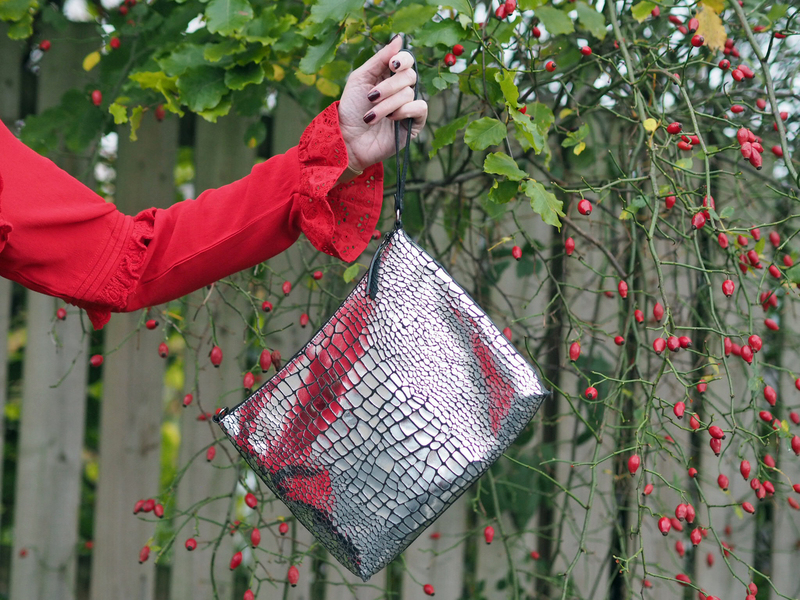 The leather metallic clutch bag is from House of Fraser and is currently reduced. You might remember that I wore it as a wristlet when I went on a girls night out a few weeks ago. On this occasion, it was for a dinner date with Ian, which was, as always, wonderful. Next Post Floral Tunic Dress, Leopard Print Boots And Bee Jewellery. Pom pom jeans, what a great idea. You’re right about buying good things in M&S when you see them. I saw a gorgeous pink metallic skirt a few weeks ago but was in a rush so didn’t get it. I was sad to find it sold out. A beautiful set. The two garments are very beautiful. The pants with the final embellishment are spectacular. I love all the details of your look. The Color of your blouse is fabulous. LOVE this!! I regularly go for the great pants and ordinary tops yet you’ve certainly roused me to attempt the bolder hues! what’s more, this are the best mix particularly the unsettle top looks so glitz and the method for styled this looks so charming..
My oh my, this red and black combination looks stunning with your blond hair! 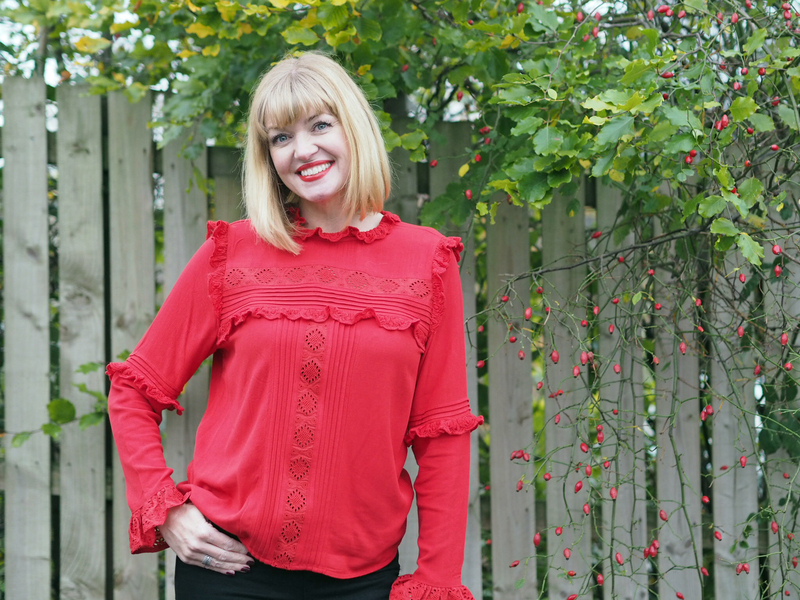 I’m a recent convert to all things red and really love this ruffle blouse for its femininity. The pom pom trim looks fun and is something I think I may try my hand at as a little diy project. Thanks for the inspiration!